2018 has certainly started with a bang. I had the pleasure of being co-chair of the best People Analytics & Future of Work (PAFOW) conference yet last week in San Francisco (write-up to follow next week). As my co-chair Al Adamsen so presciently outlined in his opening to the conference, people analytics has evolved into its third iteration, whereby value is increasingly being delivered to employees. Subsequent speeches from the likes of RJ Milnor, Jeremy Welland, Jonathan Ferrar, Josh Bersin, Charlotte Nagy and Gianpaolo Barozzi reinforced this sentiment. This demonstrates that people analytics is moving in the right direction and with Bersin by Deloitte’s recent High-Impact People Analytics study finding that 69 per cent of large organisations now have a people analytics team, the growth of the discipline shows no signs of abating. As the use of people analytics broadens and deepens within organisations so does the amount of literature published on the field. This means that my previous strategy of collecting and curating the best articles on a bi-monthly basis is no longer enough. Henceforth, this series will appear on a monthly basis and not only gather the best articles, but the best podcasts on people analytics too. One of the reasons that interest in and adoption of people analytics is rising is its integral role in digital HR strategy. Indeed, as Volker Jacobs outlines in this excellent piece, analytics is one of the three key priorities of a digital HR strategy: i) actively manage the customer expectation of the function, ii) develop the organisation from jobs to skills based, and iii) provide people analytics insights. As Volker correctly asserts, digital HR is not simply about digitising what HR has done in the past, but is an opportunity to do things differently (and better). Volker’s model illustrates perfectly the enhancements that are needed to innovate and shift the culture of HR. Data and analytics is fundamental to this shift. This is a must-read for any HR or business leader about to or thinking of embarking on a digital HR strategy. 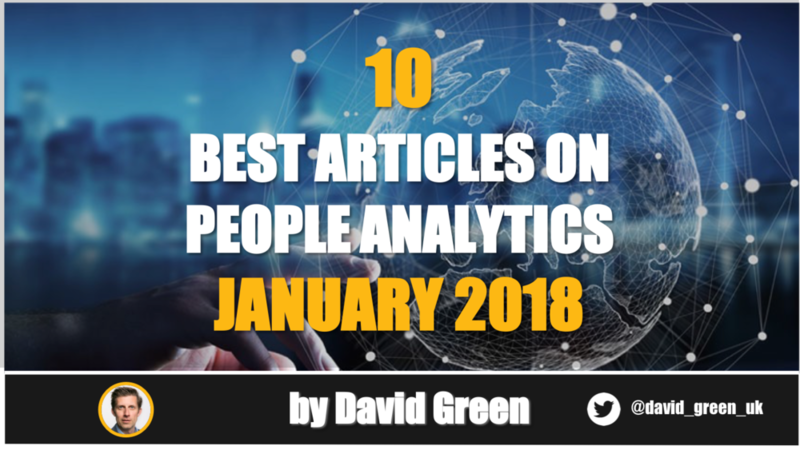 To read the other articles comprising the Top 10 People Analytics articles of January 2018, please read the full blog on LinkedIn.